In the new James Bond film 007 is played by the beloved Daniel Craig. We will discover the origin of his martini, Aston Martin, and why he dislikes all crispy pancakes except for the cheese ones. The story behind the film is even more thrilling. Having embarked on an adaption of Ian Fleming's first novel Eon realised, to their horror, that no actor was capable of doing it. A leaked memo revealed the extent of the casting crisis. Ewan Mcgregor was 'too short'. Eric Bana 'not handsome enough'. Hugh Jackman 'too fey'. Matthew Mcfayden 'a dipstick'. Adrian Paul was 'having a laugh'. Gerard Butler was deemed unsuitable for 'giving Barbara Broccoli a funny look while she was eating her pudding in a London restaurant in 1999'. Even Daniel Craig was originally ruled out for being 'too brilliant'. Broccoli was genuinely concerned that audiences might 'spontaneously combust' if they saw Craig in his swimming-trunks. Thankfully, sense prevailed and after consultation with the appropriate health and safety boards Craig was signed to the delight of Bond fans everywhere. But it could all have been so different. Luke Quantrill travels into a parallel universe to review Bond 21 as it would undoubtedly have been without Daniel Loughton Barnarby Craig. The last time I was subjected to such an obstreperous torrent of double-entendres the culprit was the big screen version 'Are You Being Served?'. I can say without fear of understatement that Mrs Slocombe and her cat have nothing on the cast of the latest James Bond film, a picture that makes Moonraker look like The Seventh Seal. Nuts Mr Bond? The latest incarnation of 007 is British born US soap-star Clive Robertson, a man so smugly handsome that the twinkle in his left eye is insured for a sum of not less than seven figures. Robertson camps it up in this film like a twinkle-eyed, barbie ken-doll, deodorant commercial shaving-foam model, milk-tray man out at a Judy Garland tribute night with The Village People fan club. 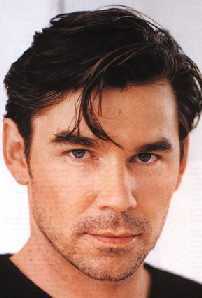 He actually tries to impersonate Pierce Brosnan but more often than not it is the spirit of Doug Mclure that surfaces. If a giant octopuss and Peter Cushing as a batty Professor entered the film one really wouldn't be surprised. After a CGI flying-saucer pre-credit sequence and Chris Cornwell's mediocre song 'You Know I'm On The Moon', the sparse plot sees 007 blasted into space again to thwart the plans of Count Frederick Dinage (Mads Mikkialson) and his shapely tin-foil outfitted assistant Hattie Sims (Eva Green). Lines such as "May I press you to a biscuit Mr Bond?" do no favours to these actors. Lee Evans raises a few laughs a 'Q' but it is jarring to see Judi Dench arrive on the moon in a pair of hover-boots to explain the plot. Felix Leiter is played by Jeffery Wright but for reasons best known to themselves screenwriters Alan Purvis and ken Wade have followed the continuity established by Licence To Kill and poor Jeffrey plays the part on crutches with a wooden leg. Just when you think it can't get any worse Richard Branson pops up in a cameo. I must confess that I missed a key-section of the film. Robertson's teeth temporarily blinded me and I spilt a carton of Um Bongo over my friend and fellow film-critic Christopher Tookey. In the resulting chaos my choc-ice somehow ended up down Derek Malcom's cat themed pullover. His outburst was so obscene that the cinema manager had to appeal for order. Malcom pointedly crunched on a packet of travel-mints for the rest of the film and cut us several dirty looks. Tookey told me that he was a picnic compared to Barry Norman. Norman used to ruin press screenings by throwing popcorn. At a Royal Charity Premiere in 1989, Norman was removed for 'making monkey noises from the back row'. The special-effects in this film are straight out of a cheap television series set in Vancouver where a man with capped gums and a blonde rental bimbo battle an alien invasion of Earth. We never see any aliens and the invasion seems to entirely encompass a city that looks just like Vancouver. The show is canceled after ten episodes and can be seen on an obscure television station near you at 3am. It comes as no surprise to know that the latest Bond film was shot in Vancouver, although a former Soviet Republic stood in for the moon. How Eon must rue the loss of the 007 stage at Pinewood which is now the world's largest 24 hour emergency wicker warehouse. For me the low-point of the film and the series as a whole, is the scene where Bond (in full tuxedo with astronaut helmet) throws a dwarf off the roof of moonbase alpha and declares that "He certainly had his shortcomings." It's a cheap gag in poor taste and the only person who laughed at our screening was the actor Sean ("Cup of tea and a slice of cake") Pertwee who'd arrived late and started a loud mobile-phone conversation. The product placement in this film is shameless. Robertson wears a Sony cap for much of the film and his gadgets include: a toaster that can turn into a car, an invisible alarm clock, a breville toasted sandwich machine that can turn into a helicopter, an invisible kettle, an alarm clock that can turn into a speedboat and wake you up with an invisible cup of tea, a pair of invisible roller skates, an Acrostar Jet that can turn into a breville toasted sandwich machine and a remote control that can pick up any signal in the world (except Channel 5) and turn into an breville toasted sandwich machine and make you an invisible sandwich.